Charming country cottage on a working estate in the Scottish countryside. With wooden beams, panelling, window shutters and a log fire. Dogs allowed in this cottage, sleeping in kitchen only. Barn & Stable Cottages both sleep four in a double and a twin room. One cottage has been recently refurbished but still retains its old country charm, with open fire and wooden beams. 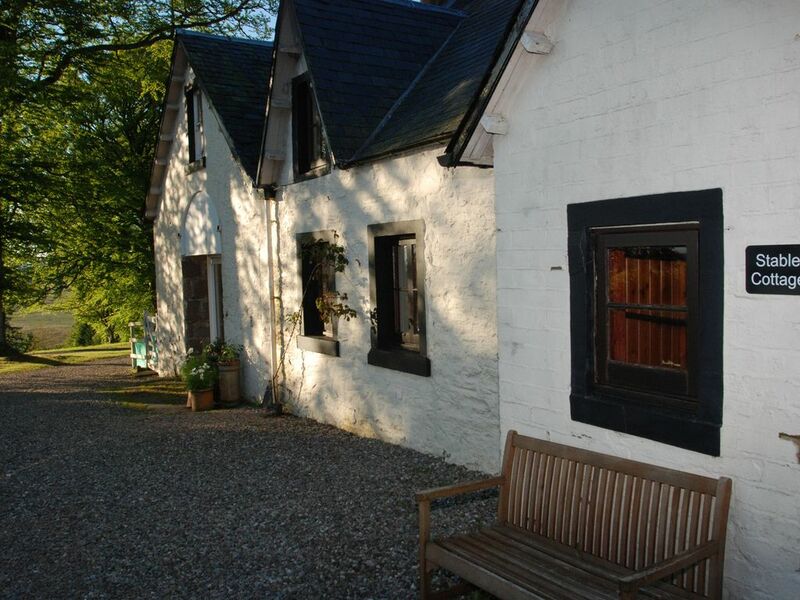 The second cottage was converted from Estate barns to a cosy cottage with modern facilities. The location, in the Ochil hills, feels remote but is only 4 miles from nearest town with pubs, restaurants, supermarkets etc..
Hello, we are Bev & Drew and we live on and manage a lovely Scottish country estate for a family trust and let out the mansion house plus two cottages for holidays. The amazing views and feeling of tranquility - and the wildlife! Electric underfloor heating, radiators, electric towel rails & open fire. Due to distance from nearest junction, this can be intermittant/slow. OK for emails or checking bank etc. Please leave streaming and large up/downloads for your own WiFi. Sugar, tea & coffee and condiments provided Welcome pack of seasonal goodies. Gemma, So glad you enjoyed your stay here & thank you for your kind comments. We rented the cottage at short notice after our Greek holiday fell through last minute in August. We ended up having one of our best family holidays at this cottage. It was clean; Bev the manager was very welcoming and our special requirements were also accommodated (anti-allergic bedding). The cottage is conveniently located for sights and outdoor activities, as well as some great restaurants nearby. Our 2 children loved exploring the area. Highly recommended accommodation. We thoroughly enjoyed our stay at Stable Cottage. It was clean and well maintained and the beds were really comfy. The provisions Bev left for us were very welcome and the gooseberry jelly was delicious. Drew very kindly left kindling and peat for us and we had a few roaring fires in the evening. The grounds were lovely to walk in and Dunblane is very close with a variety of places for coffee and food. There is a very good butcher if you choose to cook and the Sherrifmuir Inn is fabulous if you don't (600 yards from cottage). The Trossachs are within easy reach as are many historical sites. Don't buy sandwiches if you visit Loch Katrine! We would highly recommend Stable Cottage and hope to visit again next year. Description was accurate and location lovely. Cottage was clean and comfortable. For 4 people a dishwasher would be an advantage! The manager was friendly and helpful, internet was free and pets were allowed.Main attraction is walking but Dunblane, Bridge of Alan and Stirling and Perth are accessible by car. Wallace `Monument and Stirling Castle can be visited and many other attractions further afield. A pub on Sherriffmuir is within walking distance. Would recommend this cottage to friends who enjoy a peaceful very rural Scottish holiday with suitable clothes for the great outdoors! Delightful cottage, lovely rural setting. Very enjoyable, directions to cottage were good and the facilities were as advertised. Bev made us very welcome with a tour of the very clean and well presented cottage and to contact her if we had any questions or problems during our stay. Bev was very approachable and hospitable. The homemade bread, delicious jam and local eggs on the kitchen table, very comfortable super king bed (good quality bed linen and towels), comfortable sofas to relax on (we're tall so it was nice to have decent sized seating) overall ambience of the cottage including the welcome and the care taken of the surrounding areas around the cottage was very good and we will definitely be recommending Cauldhame to friends and family. Glasgow & Edinburgh Airports are both within 1 hour driving. Rail station in Dunblane 4 miles away, taxi to property available. Use of car recommended. Tesco, Co-op and M&S Food supermarkets in Dunblane. Also two excellent butchers, a chemist, post office, gift shops, florist etc. and RBS and Bank of Scotland branches (both with cash machines) on Dunblane High Street. Sheriffmuir Inn within 1 mile and several pubs/restaurants/cafes in Dunblane. Dogs: Up to 2 dogs are welcome in this cottage, on the ground floor only and sleeping in the kitchen. A charge of £20 per dog is required. Booking Notes: A refundable Good Housekeeping Deposit of £150 is also required for each cottage - due 1 week before and refunded 1 week after your stay. Please note full refunds are not given for cancellations made less than 8 weeks to your stay. Changeover Day: Saturdays in peak seasons - arrive after 4:00pm; leave before 10:00am Start day can be flexible outwith the summer/Easter/Christmas periods Notes on prices: Prices include VAT and are stated for each property but we are open to all reasonable offers.